Third week of our first winter farmers’ market and it’s going great. So far, the weather hasn’t been bad, so it doesn’t seem entirely radical to have freshly harvested greens and carrots this late in the season, but it’s still quite a novelty at our market. 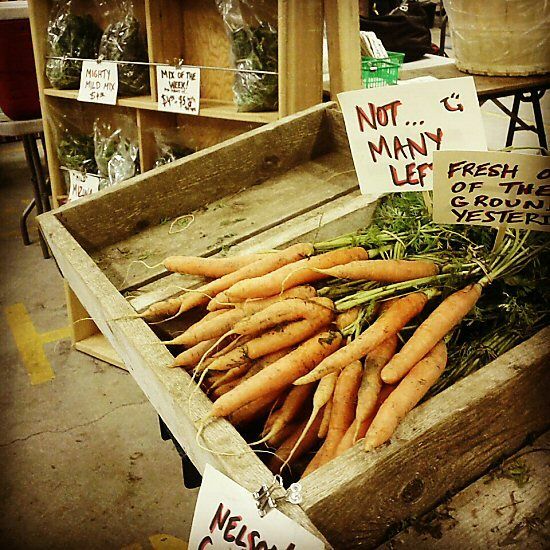 One other small farm is doing the same season extension stuff for the first time this year, which is cool, it makes the idea of fresh, local food well past the usual outdoor season seem…doable. Which it obviously is. After the last few years of ending the market, outdoors, on the last Saturday of October, being up and running this late in the year feels excellent, and going till Christmas will be fun. Only downside of being indoors here is the rather ghastly lighting, but like most things, you get used to it, and warm is good. On the stand today (and almost sold out by mid-morning): carrots (Nelson), spinach (Bloomsdale), mizuna, mustard, arugula, everything harvested yesterday.